The iPhone SE's 16 GB and 64 GB models are upgraded to 32 GB and 128 GB, respectively. The more spacious model gets a $50 price increase, while the base model's price stays the same. As we all know, 16 GB is not enough storage for a modern smartphone, and Apple finally recognizes it as well. It has quietly replaced the 16 GB iPhone SE with a 32 GB model, and likewise replaced the 64 GB version with a 128 GB model. 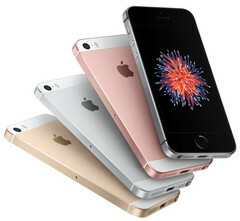 The new 32 GB iPhone SE retains its predecessor's price at $399, but the 128 GB model suffers a $50 price bump to $499. Both iPhones' specs are unchanged—each still has a 4-inch Retina display, with a 1136x640 resolution at 326 PPI; a 64-bit Apple A9 processor; a 12-megapixel rear-facing camera that records up to 4K/30 FPS video; and a 1.2-megapixel front-facing camera. Both models support Touch ID and Apple Pay. The new iPhone SE features four finishes: silver, gold, space gray, and rose gold. Unfortunately for eager buyers, the new iPhone SE is not yet on sale. Like the just-unveiled iPad, it will be available for purchase on March 24. It will be sold under contract with one of the big four carriers (AT&T, Verizon, T-Mobile, or Sprint). There will also be an option to purchase the device SIM-free. The new iPhone SE's increased storage capacity should ease the disappointment some people felt with the 16 GB model. Given that none of Apple's iPhones—or iPads—feature removable storage, it makes sense for the company to increase its devices' internal storage. Although streaming media and cloud-based storage are increasingly becoming the norm, there are many iPhone users who still prefer to keep their stuff on their device. Providing ample internal storage capacity should go some way towards making sure they stick with Apple and not look elsewhere.